Apart from having breath-taking scenic beauty, ‘God’s own country’ is popular for its elaborate dishes, the flavour of which will linger on your minds for a long time. The Kerala cuisines are meticulously prepared with coconut ingredients, exotic spices and plentiful love. Here is a list of must try dishes in Kerala as we leave the savouring part to you, on your exquisite culinary experience in Kerala. An elaborate feast, Sadya is not for the faint hearted. It is a meal comprising of varied vegetarian dishes. 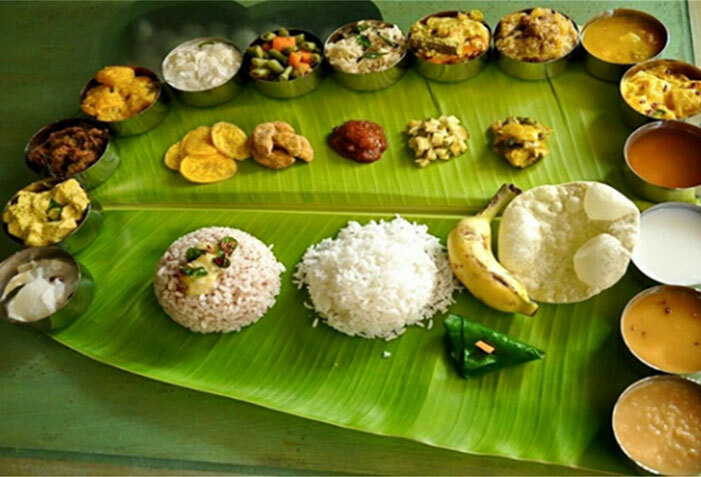 This traditional meal is served on banana leaf and is prepared on the occasion of Onam or wedding ceremonies. The distinct flavours in each bite are rich and tasty. On your Kerala Tour, do not miss Sadya which has olan, sambar, aviyal, payasam and a list of endless dishes. On your Kerala Tour, do not miss out on Puttu and Kadala curry which is served for breakfast. Puttu is rice flour mixed with coconut gratings and can be eaten with banana. But it tastes heavenly when paired with Kadala which is chickpeas curry which is rich in spices and flavours. This popular breakfast dish is rich in protein and is one of the top cuisines in Kerala. If you are a prawn lover, you cannot afford to miss out on the traditional prawn curry on your Kerala Tour. A variety of prawns are cooked deliciously with pepper, salt, chilli, coconut milk and jaggery. It is then garnished with curry leaves to leave your taste buds tingling. Popular for sea food, Kerala style prawn curry is one of the most delicious local dish in Kerala. On the list of top cuisines from Kerala is another dish- NaadanKozhi curry, an exquisite chicken curry which is thick and spicy. It is creamy because of the coconut milk and tastes flavoursome with all the spicy and tangy ingredients. This lip-smacking curry goes with breakfast dishes, rice or parottas. The legendary NaadanKozhi Curry is a must try dish for non-vegetarians on your Kerala Tour. Appam is a special Kerala dish that is made with rice batter and looks like a pancake. The centre is soft and thick whereas the corners are paper thin. It can be eaten with any vegetarian and non-vegetarian curry. Appam tastes the best with stew which has pepper and green chillies. Chopped meat or vegetables along mixed with coconut milk tastes irresistible in this simple Kerala stew. As you enjoy picturesque view on your Kerala Tour, try the traditional delicacies of Kerala- parotta that originated in the Malabar region along with the famous beef fry. The dough for parotta is beaten and spread into spiral thin layers. It is then roasted into crispy parottas with ghee. The beef fry is beef stirred with onions, pepper, ginger, garlic and spices like cardamom, cloves, etc. Indulge in some fine food experience in Kerala with the combination of Kerala Parotta with Beef Curry. You are going to be offered a number of breakfast options on your Kerala Tour. Another one on that list is Idiyappam which is also known as noolappam. It is made with rice flour, water and salt. Thin strands are entwined to create this delicious and healthy breakfast dish. To enjoy idiyappam to its best, have it with egg curry as you savour each bite. Offering some tasty vegetarian options on your Kerala Tour is the popular Erissery. It is a stew cooked using sweet pumpkin and dried lentils. Cooked in coconut mixture, mustard seeds, curry leaves and red cowpeas, this traditional Kerala cuisine is best served with hot rice. The famous Thalasseri Biryani is a treat for all the Biryani lovers. The flavours and spices that this biryani offers will leave your inner food soul satisfied. A unique variety of rice which is thin and fragrant called kaima is used for the preparation of this exclusive dish. Charcoal is placed over the lid of the container in which this biryani is cooked. Payasam is kheer which is the most delicious dessert in Kerala and is served after Sadya. PaladaPayasam is milk based sweet dish made with milk, sugar and rice ada. Dry fruits such as cashews and raisins are also added to garnish the traditional delicacy from Kerala. Food experience in Kerala is an elaborate and exclusive affair. Relish the rich authentic delicacies on your next Kerala Tour. To explore Kerala and know more about it, get in touch with Travel Bug India. 8 unexplored South India destinations that should be added to your bucket list right now! Explore Kerala, The Green Heaven on Earth!